This tab is used to manage the properties of the particles themselves. The most simple are Velocity and Size: any pre-defined example may be used to study these two notions. - The Weight of a particle has an influence on its movement if the Gravity parameter in the World tab is not set to zero: the heavier a particle, the more the force of gravity will accentuate its movement. The lighter it is, the less effect the force of gravity will have. A Weight of zero has the result that the particle is not subjected to the force of gravity. If you place the pre-defined example (nature > sun) in the stack and then modify the gravity parameter, you will note that this has no influence on particle movement. - The Bounce parameter is used to set the particle bounce strength (the Alpha Collision box of the World tab must be checked and a collision source chosen…). - The Friction parameter is set to slow the particles down. If the particles move through the air (which is most often the case), we are dealing with air resistance. The latter is low and a parameter set at a value close to zero will be sufficient. There are, however, other situations : let's assume that the balls are thrown at floor level. These balls will slow down and stop due to the friction of the floor. If the same balls are thrown on a lawn, they will be stopped even faster. The pre-defined example (objects > dice) also provides an interesting case: by increasing the Friction parameter to 180, and due to the fact that the particles grow smaller in size during their life span, one gets the impression that the dice roll on a surface and, after a certain limit, fall into a void. 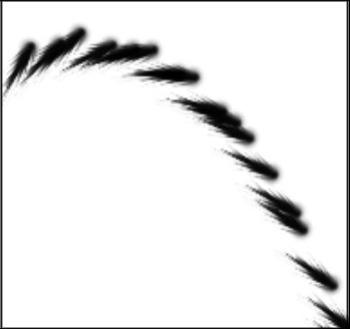 - The Opacity parameter is used to set particle transparency. 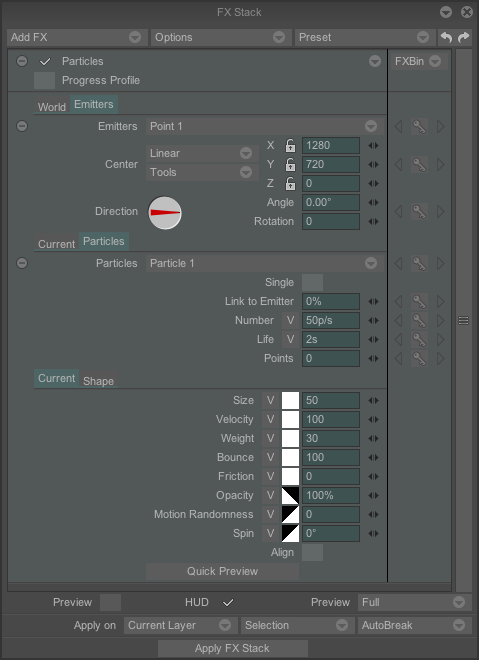 - The Motion Randomness parameter controls the movement of imperfect particles and accentuates the realistic aspect of the particle jet. It is used, for example, to create an uneven fog, movement of bubbles in the air, smoke, etc. 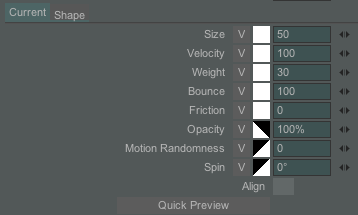 This parameter is used to avoid having to create too many animation keys which would be required to render a trajectory uneven. This parameter comes into its own with the Variation parameter described hereafter. The pre-defined example (party > popcorn) uses this method. Its use may provide various results. As required, study the pre-defined examples (objects > dice) and (objects > tetris). - The Align parameter, if enabled, acts on the rotation parameter and directly turns the particles according to their trajectory. See below : two particle jets with and without alignment. All parameters studied have the parameters Variation and Profile to their left. 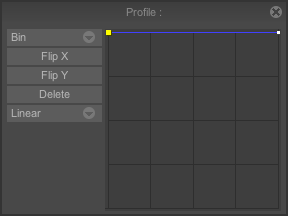 The profile preset is used to vary a parameter (Size, Velocity, Opacity, Bounce, etc. ) during the life span of a particle. Click on one of the profile icons to open a traditional profile window. We have already seen these when studying the drawing tools. Let's take the pre-defined example (pyrotechnic > smoketrailc) shown opposite. The three circled profiles below are those used in this example. * The smoke particles are small close to the emitter source and become bigger as the smoke dissipates in the air. * The smoke particles are opaque at the beginning (yellowish-orange areas) and become transparent at the end (red-black areas). * A parameter with the profile indicated opposite does not vary during the period the particles are displayed and remains at the value you have chosen. The Variation represented by the V button is used to render the parameter with which it is associated more or less random. Click on the V icon to enter a numeric value in this field. For example, if the particles Size parameter is set at 50, a Variation with a value of 25 means that each particle emitted will have a random size ranging from 25 to 75. In the example given above (misc > plumefury), the variation function was used to attribute the particle Size, Spin and Life random values. Combined with the Motion randomness parameter and correctly used, the Variation function provides excellent results. 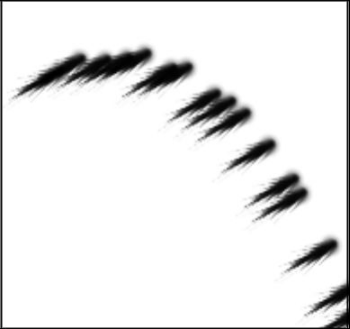 It is almost impossible to tell that a computer was used to create this effect!